Geraldine enjoyed a very good start to her training with a former Trainee of mine, Lara Heggelmann. Lara rode and trained her until she was 5. 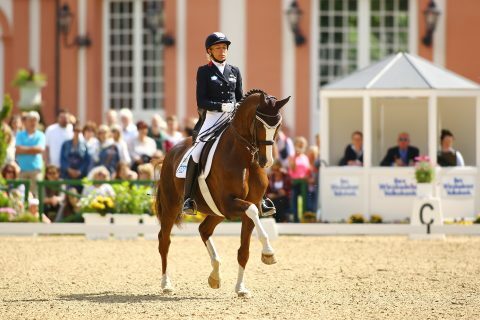 Under Lara she won and placed at L level and qualified for the Bundeschampionat. With this foundation she is very easy to train further. At the end of her 5th year she came to my stable. I, together with Faith Berhuis, also an owner of my Father, her breeders Family Zeising with the stud “Gut Schwaighof” have shared ownership. Geraldine is a big framed Chestnut mare with very good paces. She is elegant, motivated and eager to please. She has a lot of respect for other horses. We are working in small steps to increase her self-confidence and bravery. She is intelligent and wants to do everything right for the rider. In 2014 she was successful at M level and qualified for the 2015 Bundeschampionat. In 2015 she competed at S level, with high placings. 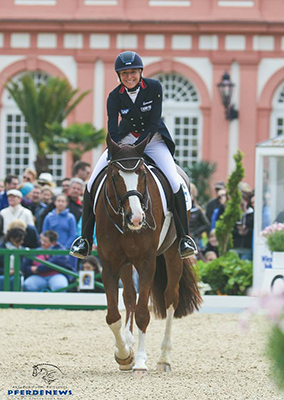 In 2016 Geraldine shone in the competition arena. 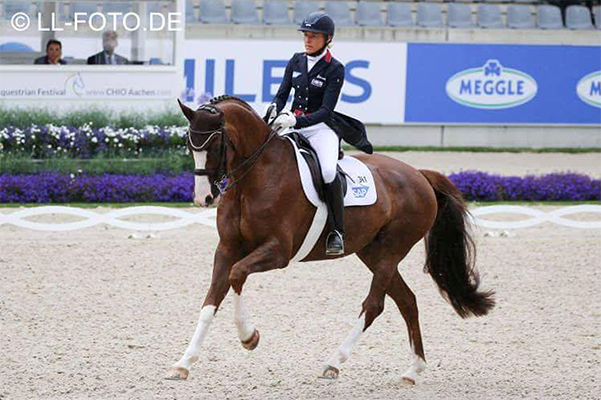 She won multiple Prix St George and Intermediate 1 tests and successfully qualified for the Nürnberger Cup. Geraldine had her Grand Prix debut as a 9 year old, qualifying in 2017 with her first start for the final of the Louisdor Prize. She has been successful nationally and internationally at various competitions in both Grand Prix and the Grand Prix Special. I’m proud the consistent success she has achieved in her first year at Grand Prix. 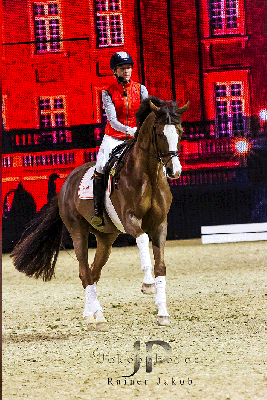 Geraldine will not be presented at competitionsin 2018, as she unfortunately has to take a break for health reasons. We are devastated. SAP Geraldine should have spent the summer out in the fields. Unfortunately due to suffering from chronic laminitis inflammation, it was with heavy hearts that we said goodbye. We will always remember her as an amazing and enchanting dancing queen!